So there I was a few months back, watching The Oscars (I have no idea WHY I was watching The Oscars, except maybe due to some masochistic tendency) when they came to a segment about the first movie that stars remember seeing (or the film that first made them want to make movies, can't remember which). As I watched in a semi interested state, Brad Pitt eventually appeared and said something to the effect of, "There was this film called... Gargantuas, I think. The Brown Gargantua sacrificed himself to destroy the Green Gargantua...". It took a few seconds for me to process what I was seeing and hearing; Brad Pitt casually mentioning a favorite Japanese monster movie at The Oscars. Once the reality of this positively surreal moment caught up with me, I was floored. It was practically an out of body experience that compelled me to go online just to make sure I hadn't imagined it. 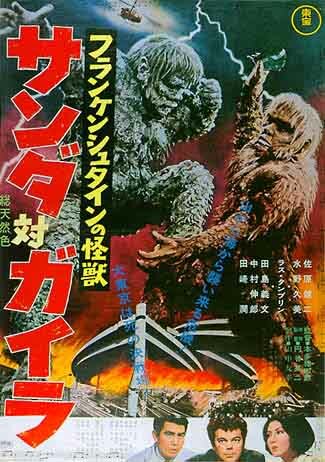 As I mentioned in last week's entry, The War of the Gargantuas is Toho's sequel to Frankenstein Conquers the World. Originally released in Japan under the title Frankenstein Monsters: Sanda vs Gaira, it originally involved two Frankensteins that were born from the cells of the Big Frank of the previous film. However the details of this even now, are a bit sketchy. Exactly how the two Frankensteins (Sanda the 'good' brown one who comes from the mountains and Gaira, the evil man eating green one who comes from the sea) came into being aren't fully explained (as per usual with Japanese 'Kaiju'). The general theory is that Sanda was born from the original Frank's severed hand and Gaira was born from flesh that Sanda scraped off when near the ocean at some point. There is an alternate theory (one that I think may be true) that Sanda IS the original Frankenstein (as flashbacks and some dialogue seem to point out). Regardless, when U.S. producer Henry G. Saperstein saw the finished product, he objected to the monsters' design. Even with the understanding that these films can be a little vague, he vetoed the idea of a sequel where the two monsters look nothing like the original. He had the name Frankenstein eliminated from the title and all references to the first film were dropped. The story (in America anyway) was rewritten to call these two beings Gargantuas, genetic freaks of nature (or something to that effect). Replacing Nick Adams in this mythic pic was Russ Tamblyn and his somnambulistic (and completely outre) perf here could not have been more opposite to his predecessor's adrenalized emoting. It is to Kumi Mizuno's credit (as well as her natural beauty) that she keeps the scenes between her and ol' Russ as tight as they are (she certaintly didn't get much help). Despite the amazing visual that is these two color coordinated Gargantua/Frankenstein twins tossing each other around Tokyo with reckless abandon (utilizing some of the coolest and most terrifying makeup effects in Eiji Tsuburaya's career), the one scene that truly stands out (and one that causes the proceedings to grind to a screeching halt) is the moment that one Kipp Hamilton takes the stage in a nightclub. There she badly warbles the legendary tune 'The Words Get Stuck in My Throat' (aka Feel in My Heart). Apparently Kipp was a 'special friend' of Mr. Sapperstein and that is the only probable reason for her being in the film. O.K. she's not a bad looker either, but my God, that voice! YIKES!!! So utterly Psychotronic was this tune in every way that Devo were to cover it in their live act over the years. The War of the Gargantuas is a childhood fave that still holds up. I still get a thrill and major goosebumps whenever I watch it (which is fairly freqently). It is just as exciting and bizarre as the first time I caught it on a Friday night back as a wee 7 year old and remains (along with Destroy All Monsters) my top Toho Kaiju bashfest.